I was thinking the other day: every time I make a pasta dish, I use a cashew cream-based sauce; never a red sauce. Mostly because traditionally, homemade tomato sauce takes an hour or more to cook, and cashew cream — aside from the overnight soaking of raw cashews — takes no time at all to whip up and prepare a sauce with. So I decided to invent a quick tomato sauce made with fresh tomatoes and an added ingredient to cut the cooking time in half. The result? My tomato sauce tasted incredibly fresh and just as lush as any sauce you'd pick up at the supermarket. I was happy. And I figured: Why buy tomato sauce when you could make your very own so quickly and easily? Prepare the tomato sauce: Heat olive oil in a large casserole pot over medium heat. Add onions and garlic, and cook until the onions are soft and translucent. Add the tomatoes and let simmer stirring occasionally, until all tomato pieces have cooked down (about 20-30 minutes). Stir in tomato paste and continue to simmer, stirring occasionally, until sauce reaches desired thickness. Stir in basil, salt, pepper and Italian seasoning to taste. 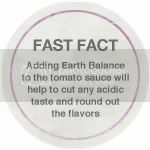 Stir in Earth Balance until melted and incorporated into sauce. Add the veggie sausages. 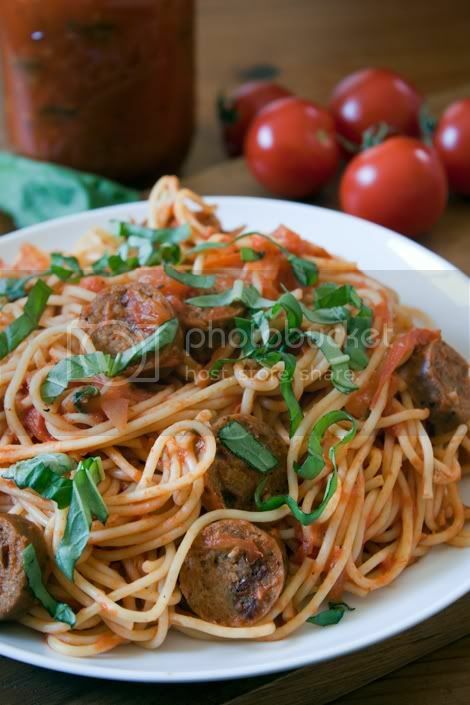 Cook the spaghetti: While the sauce is simmering, bring water to a boil in another large pot. Salt generously and add spaghetti. Cook the spaghetti according to the package directions. Drain and return to cooking pot. Prepare the pasta: Add the tomato sauce to the spaghetti and toss until thoroughly coated. Serve family style on a large dish, garnished with chiffonade basil.